LimeSDR-PCIe is low-cost software defined radio board based on Lime LMS7002M Field Programmable Radio Frequency (FPRF) transceiver and Altera Cyclone IV GX PFGA, through which apps can be programmed to support any type of wireless standard, e.g. UMTS, LTE, LoRa, GPS, WiFi, Zigbee, RFID, Digital Broadcasting, Radar and many more. 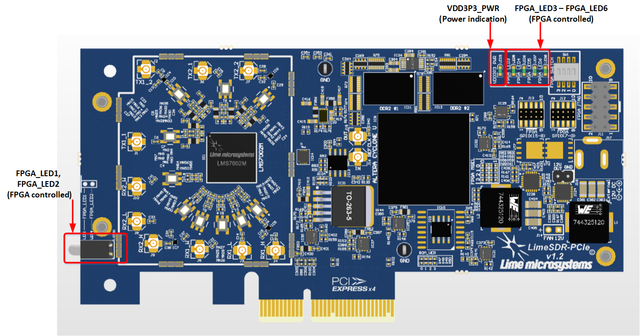 The LimeSDR-PCIe v1.2 board from full package showed in Figure 1. The LimeSDR-PCIe development board provides a hardware platform for developing and prototyping high-performance and logic-intensive digital and RF designs using Altera’s Cyclone IV GX FPGA and Lime Microsystems transceiver. LimeSDR-PCIe board version 1.2 picture with highlighted major connections and components presented in Figure 2 and Figure 3. There are three connector types – data and debugging (PCIe, FPGA GPIO and JTAG), power (DC jack - optional) and high frequency (RF and reference clock). LimeSDR-PCIe board version 1.2 picture with highlighted components on top presented in Figure 2. LEDS1 or LED1, LED4 Red-green status LEDs User defined FPGA indication dual colour (red – green) LEDs. LEDS1 if two TH LEDs with standoff or two SMD LEDs are populated. LED5-LED8 Green status LEDs User defined FPGA indication green LEDs (LED3-LED6). J18 Pinheader 12V internal power rail. Can be used to power external devices. IC9, IC10 Flash memory 64Mbit Flash for FPGA configuration (only one is soldered). XO1, XO2 VCTCXO Voltage Controlled, Temperature Compensated Crystal Oscillator (30.72MHz, only one is soldered). SPI Interface: LMS7002M transceiver is configured via 4-wire SPI interface; FPGA_SPI0_SCLK, FPGA_SPI0_MOSI, FPGA_SPI0_MISO, FPGA_SPI0_LMS_SS. I2C Interface: used access EEPROM memories for LMS7002M MCU firmware and data. I2C interface is using LMS_I2C_SCL, LMS_I2C_SDA signals. LMS_RXEN, LMS_TXEN – receiver and transmitter enable/disable signals. For data transfer LimeSDR–PCIe board has PCI express connector with four lanes. PCI express interface is implemented in FPGA. Pin connection and corresponding signal names are listed in Table 3. LimeSDR-PCIe board has two 128MB (16bit bus) DDR2 SDRAM ICs (AS4C64M16D2-25BCN [link]) connected to double data rate pins on Cyclone IV GX 1.8V Bank 3, 4 and 5. RAM chips (IC11, IC12) are connected to separate memory controllers so RAM chips works in dual channel mode. The memory can be used for data manipulation at high data rates between transceiver and FPGA. Pin connection and corresponding signal names are listed in Table 5 and Table 6. LimeSDR-PCIe board low speed interfaces is presented in Figure 4. More detailed information is provided in the following sections. LimeSDR-PCIe board comes with 6 indication LEDs which can be controlled from FPGA. By default, two of them (FPGA_LED1 and FPGA_LED2) are trough-hole dual colour LEDs and are mounted on the back edge of the board using right-angle plastic holder. The remaining four LEDs (FPGA_LED3 to FPGA_LED6) are SMD single green colour LEDs. There is one SMD single green colour LED named VDD3P3_PWR which is hardwired to VCC3P3 power rail and lit up whenever the board is powered on. Flash for FPGA gateware: Flash memory (IC9 or IC10) is used to store FPGA gateware. 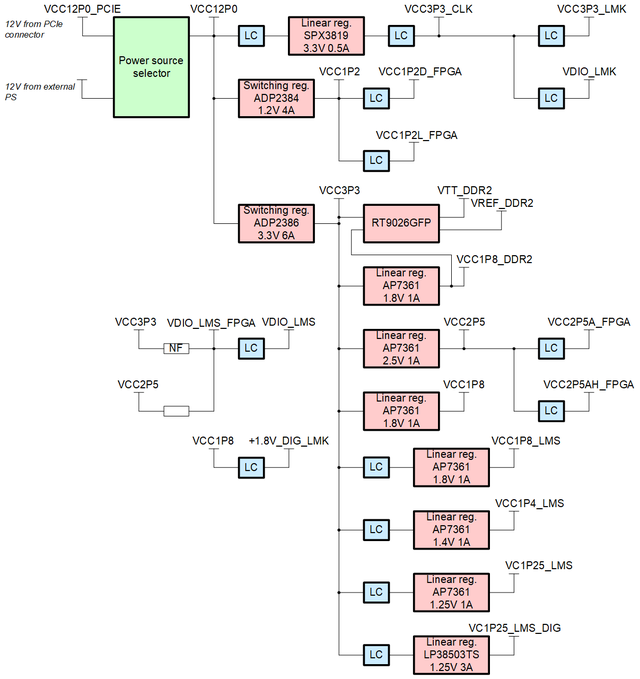 RFIC: RFIC is connected to FPGA_SPI0. Phase detector and DAC: phase detector with VCTCXO DAC are connected to FPGA_SPI1. 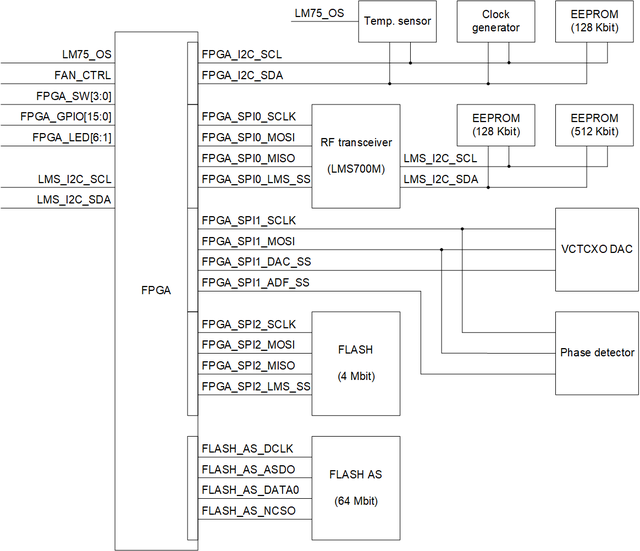 Flash memory: flash memory is connected to FPGA_SPI2. Board has two independent I2C interfaces: FPGA_I2C and LMS_I2C. FPGA_I2C: this interface has several slave devices temperature sensor, EEPROM and clock generator. Information for slave devices are provided in Table 12, signal connectivity information is in Table 13. 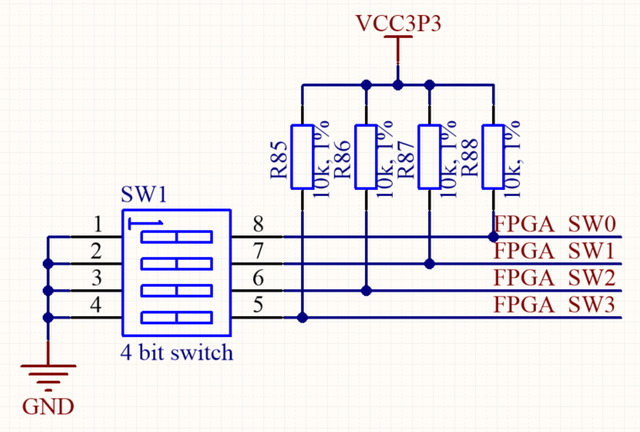 LMS_I2C: this interface has two EEPROMs. In Table 14 are listed all LMS_I2C slave devices and their information. LMS_I2C interface (LMS_I2C_SCL, LMS_I2C_SDA) is connected via 0R resistors to FPGA pins for debugging purposes, see Table 15. 4 poles slide switch SW1 is connected to FPGA. Each switch line has external pull up resistors. When switch is in position “On”, it pulls down the line. LimeSDR-PCIe v1.2 board contains RF loopback switches (IC4, IC5, IC6, IC7) for LMS7002M which are controlled from FPGA. By using loopback switches RF path TX1_2 can be connected to RX1_H and TX2_2 to RX2_H. There are J12 and J13 connectors (pinheaders) there 8 + 8 FPGA GPIOs are connected (3.3V IO compatible) with GND and power pins (3.3V). In Table 18 are listed connector J12 pins and in Table 19 are listed connector J13 pins, corresponding FPGA pins and other information. LimeSDR-PCIe has integrated temperature sensor which can control FAN to keep board in operating temperature range. FAN must be connected to J14 (0.1” pitch) connector. FAN control voltage is 12V. Fan will be turned on if board will heat up to 55°C and FAN will be turned off if board will cool down to 45°C. 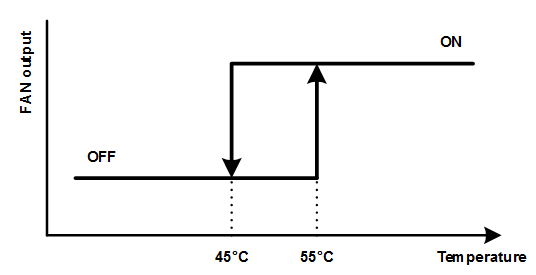 FAN control temperature range is set by FPGA. Temperature sensor output (LM75_OS) is connected to FPGA pin K14. FAN MOSFET can be controlled from FPGA pin K13 (FAN_CTRL). More detailed information about FAN control is presented in Figure 4. Measured temperature value can be read by using LMS7suite. 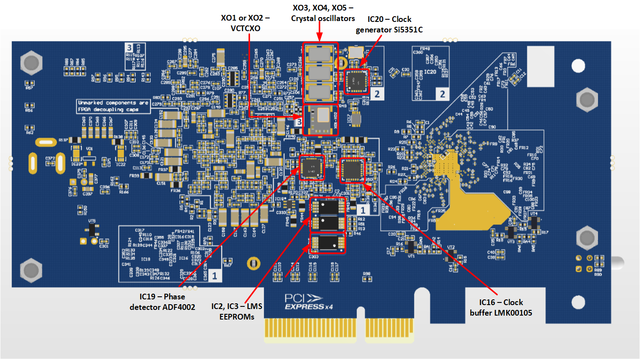 LimeSDR-PCIe board clock distribution block diagram is presented in Figure 8. LimeSDR-PCIe board has onboard 30.72 MHz ±250 ppb VCTCXO that is reference clock for LMS_PLLs. See block diagram of the clock distribution system in Figure 8. VCTCXO can be tuned by onboard phase detector (IC19, ADF4002 [link]) or by DAC (IC18). The onboard phase detector is used to synchronize onboard VCTCXO with external equipment (via J16 U.FL connector) to calibrate frequency error. At the same time only ADF or DAC can control VCTCXO. DAC and ADF is controlled by FPGA and selection between ADF and DAC is done automatically. When board is powered, by default VCTCXO is controlled by DAC. J16 connector (REF_CLK_IN) can also be used to supply external reference clock (fitting R117, removing R107, C345). J15 connector (REF_CLK_OUT) can be used to feed clock to another board for synchronization purposes. For this purpose R121 resistor has to be fitted. 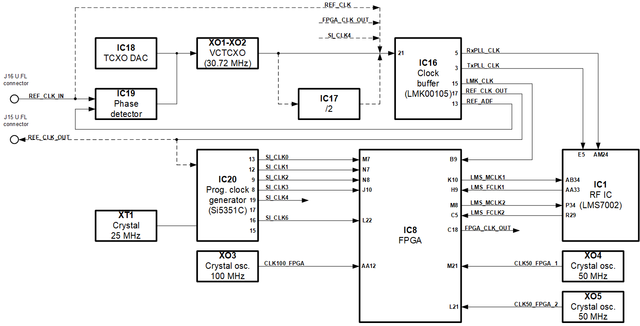 The programmable clock generator (IC20, Si5351C [link]) can generate any reference clock frequency, starting from 8 kHz – 160 MHz, for FPGA and LMS PLLs. How to configure clocks using LMS7Suite read in chapter 7.4 Clock configuration. LimeSDR-PCIe board power distribution block diagram is presented in Figure 9. LimeSDR-PCIe board is powered from PCIe port (12V). Switching and linear regulators are used to make other required voltages.